Blogging has changed my life both personally and professionally and I consider it an integral part of who I am now. It is also a critical part of an author's online platform these days, even advocated by huge publishers like Simon & Schuster. As part of my continuing education, I was part of the inaugural Problogger event in Melbourne, Australia the other day, and learnt so much as well as meeting some amazing people in many different niches. 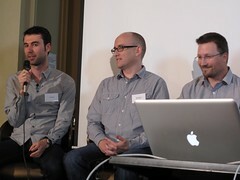 The main speakers were Problogger Darren Rowse, Chris Garrett and Yaro Starak all featured in the picture above. Here are just a few things I learnt from the day that you might also find useful for your blog. Focus on the lifecycle of people on your blog, not just getting traffic which is only the first step. This includes: Attraction, Retention, Conversion and Referral. Think about ways you can engage with people at each step. “A blog is a loyalty generator” [Chris Garrett]. Keep people coming back and over time they will know, like and trust you. This creates relationships and they are also more likely to recommend you to others, as well as buy your books/products. Don't just hang out on your own blog. Go where your readers are. Find out where else they hang out and hang there too. Then some of them may follow you back to your blog. This is also relevant to authors with books to market. Go hang out at book review sites/GoodReads/Get Glue etc and interact there. Doing a series of posts keeps people on your site longer, creates anticipation and boosts subscriber count. Anticipate big events and blog on them before everyone else is. For example, blog about the 2011 Rugby World Cup now and your posts will index well by the time everyone else is blogging about it. Build community around your blog so that people have a sense of belonging. You share values and beliefs. Then you provide value, not just information. This might be a forum, a Facebook page/group or other community sites. Then be the community you want to have, model the behaviour you want and keep the tone positive. Be a leader. Be a model. Invite interaction on your sites and reward people for contributing. Monetising your blog can be done in 3 main ways: Advertising, Affiliate Income and the sale of Products/Services. For advertising, it's best to have a very niche blog and/or large traffic. Affiliate income is selling products for other people and taking a commission. Selling your own products can provide the biggest reward. The bloggers who are making an excellent income online have been blogging 4-10 years. They have been in the market longer than most people and haven't given up in the face of criticism or failure. They have persisted, tested, worked at their blogs and promoted themselves consistently over time. They provide amazing free information, they are useful, interesting, humble and generous people. They also sell brilliant products that teach people. I have been blogging 18 months and am just starting to make an income from it. I have been writing books for 3 years and am starting to see improvement and benefits of being out there, being seen. The biggest authors are those that have been in the market a long time. The big names have 20+ books, so this lesson also stands for authors as well as blogging. So, the secret is keep going. This is an awesome blog, and very encouraging. I especially like the points about persistance, and community building, and seriously will take on board the advice about developing some free products – the idea of humility of bloggers balanced with saviness as well is brilliant! As an aspiring Author who only started serious writing 2 months ago, I cannot thank Joanna enough. I signed up for Author 2.0 Blueprint. The information is overwhelming sometime(quantity-wise), but I am in it for the long haul. Thanks for all the great information and lessons – very helpful. I have been blogging 1 & 1/2 years and have 3 books/book trailer videos on my site – the key is to keep going and not be short sighted. Bon courage!